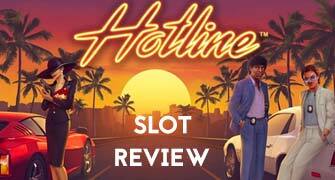 For an online video slot machine game with a twist, Hotline by game studio NetEnt is a great choice when trying to avoid cookie-cutter type games that seem like every other slot machine. One of its unique features allows players to choose one, two or three of the rows on the screen to designate as a hotline. By choosing all three at once, players give themselves the best chance of getting re-spins. Each time players get the red car wild symbol, it becomes a sticky wild and leads to one re-spin for free. The theme of the game is two detectives in the 1980s out to solve crimes in their town. Players will notice that the game is set on a swanky city street after dark. Symbols seen on the reels include sapphire rings and emerald necklaces, along with a royal pink crown embedded with jewels. Rounding out the symbols is an afro-headed man carrying a gun, a blond haired man in sleek sunglasses and a mysterious woman in dark sunglasses holding what looks like a car phone. The other important symbols in the game are the eye-catching scatter symbol. When players get three of them on the reels at once, it triggers seven spins of the reels for free. During the free spins bonus hotlines become even more valuable as if a wild symbol ends up on it. Then it is an expanding sticky wild until normal gameplay resumes. Though this is not the only 1980s detective themed slot machine game online, it is one of the most unique and best animated. Its sleek graphics make it reminiscent of detective shows such as Miami Vice. It is likely attracting players that previously enjoyed the show. While this game is available at many online casinos it is also compatible with mobile devices. Those players that choose to access the game on their mobile device will find that the colors and graphics are at their best in this format. For as visually impressive as the game is on a desktop computer, it is even more so when viewed on mobile devices. This is likely the reason why the game has become so popular with players all over the world. Its simplicity balances out nicely with its exciting bonus features and fun theme. Players will find that the game is easy to learn and fun to keep coming back to. The pursuit of the sticky wilds and lucrative free spins with hotlines activated is what keeps players engaged in the game. Its 1980s style detective show soundtrack also lends to its appeal for many players who grew up watching them. 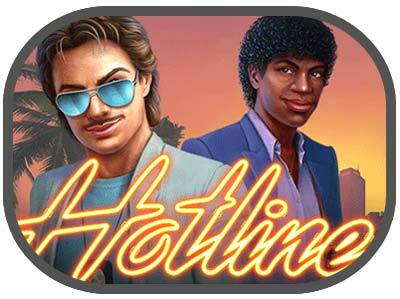 Though Hotline is a modern game, it has a nostalgic feel to it as well. Unlike other detective games, it doesn’t rely on cartoonish characters and outlandish stories in order to keep players entertained. As a result, it stands out from most other similar themed slots. It gives players a compelling reason to keep trying their luck at the game. NetEnt is some of the best game developers in the industry and their Hotline slot is one of the coolest and most fun slots of the last couple of months according to us as CasinoViking.